Normally I wouldn’t recommend anything packaged or processed. A general idea is that if it’s in a box/package it’s probably got a bunch of additives or is refined, etc. And typically that is the case. I don’t mean to contradict myself, I do feel that, more often than not, packaged foods are bad. It’s really best if you can eat foods the way they naturally come. But I do still think there’s a place for packaged foods; healthy ones, of course. Sometimes you need to have something easy-to-pack handy for when you’re rushing out the door. And there are some things I think can be chosen to still keep you snacking healthy even if you’re in a hurry. Below are some packaged foods I think are still worthy to be eaten 😉 , just make sure you’re not eating ONLY these foods (remember, moderation! ); keep plenty of fresh fruits and veggies in your diet! 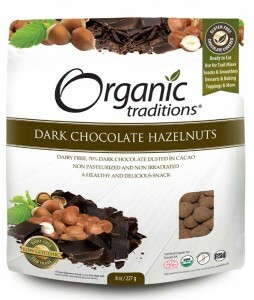 Organic Traditions Dark Chocolate Hazelnuts – These are amazing! They have only 5 ingredients – organic hazelnuts, raw cane sugar, cocoa mass, cocoa butter, and cocoa powder – and are sustainably grown and harvested. Plus they have a cool fact on the package; apparently the Mayans once used chocolate as currency!